While inspecting the issue, take pictures of the symptoms (close-up and general distribution in the field, greenhouse, high tunnel, garden, landscape, etc.). Please make sure that the pictures are high quality and in focus. Use the macro option in your camera (tulip icon in most cameras and smart phone cameras) for close-ups. Attach the pictures to an email to pidc@iastate.edu and in the subject include submitter last name, crop/plant and sample submission date (MM/DD/YY). Example: Smith-pepper-5/20/17. Collect several samples. Select plants from areas where symptoms are starting, developing and developed. Avoid plants with advanced symptoms. 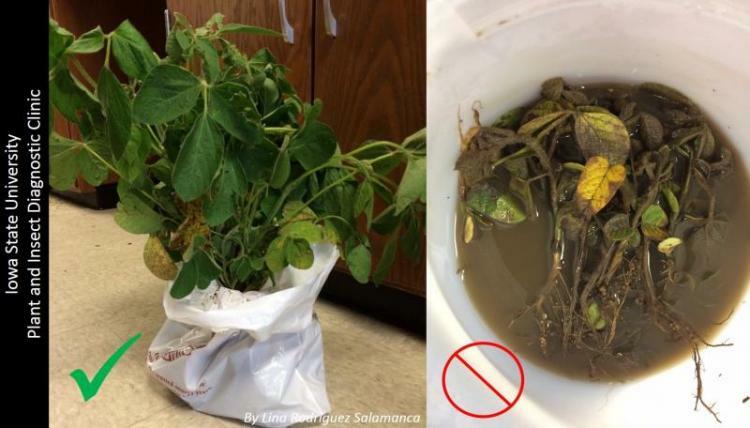 A completely wilted or dead plant is not a good subject to submit. When submitting a plant, roots and all, make sure the soil is contained, so it does not make contact with the foliage. Keep in mind we do not test for herbicide residue, nutrient levels in the foliage or soil, or these for pathogens (organisms that cause disease) in soil samples. Foliar diseases: Send 6-10 leaves showing disease symptoms with varying severity. It is also important to remember above ground symptoms can be caused by diseased roots. If you are unsure of what the problem might be, send in 2-3 whole plant samples. All samples should be wrapped in dry newspaper/paper towels. Never add water to a sample. Other details to include are cropping history, the pattern of symptoms in the field, chemical history, and cropping history.